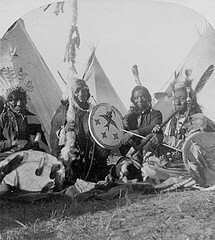 In the pre-reservation era, the Native American Sioux lived in teepees (also called tipis). These were made of buffalo hides stretched over poles that were almost fifteen feet high. There was a hole in the top to let out the smoke from a fire. Teepees were easy to assemble and dissemble allowing the inhabitants to move house quickly.